Tampa, Florida — For native Floridians 43F might feel a tad chilly, but for the thousands of snowbirds watching Weather Channel reports of record cold and snow back home, 43F can seem downright balmy. So when long-time Gasparilla Distance Classic announcer Phil Stewart came dressed for the 38th annual winter classic dressed in a pair of chino shorts this morning , I was a bit surprised given that I, a wimpy Californian, arrived swaddled in four layers and gloved up like a member of Admiral Perry’s expedition to the pole. 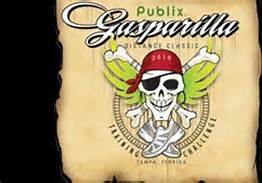 Phil, myself, and Runner’s World Magazine maven Bart Yasso were working together to inform and (hopefully) entertain the crowds lining the Bayshore Boulevard finish at today’s Gasparilla 15K and 5K, day one of the weekend long Publix Gasparilla Distance Classic. Tomorrow’s 8K and half-marathon promise temperatures at least 10-12F higher for the 6 a.m. half-marathon start and downright waxy by midday as the final 8K finishers complete their journey. In today’s 15K defending champion Jon Mott overcame a strong challenge from 2014 runner up Rafal Matuszcak to take his third Gasparilla 15K title since 2012 (he finished 2nd in 2013). Last year Mott bested Matuszcak by 20-seconds with a 48:44 clocking. This year Matuszcak challenged Mott all the way to the line, but came up five-seconds short, 47:49 to 47:54, in the excellent racing conditions. Hanson Brooks Distance Project runner Megan Goethals dominated the women’s 15K. Her 52:07 took top honors by 3:50 over runner up Rebecca Howarth, 56:07. Over 30,000 runners have signed up for the four weekend races, today’s 15K & 5K, and tomorrow’s half-marathon & 8K. All four races, in fact, sold out, a testimonial to 23 year race director Susan Harmeling and her staff who brought back pro racing to Gasparilla last year after dropping the top division following the 1997 race. Tomorrow’s half marathon should prove intriguing, especially on the men’s side as it features Olympians Dathan Ritzenhein and Abdi Abdirahman. After moving back home to western Michigan last August, Dathan has returned to form after another injury plagued year. This January he stood on two podiums, winning a cross country race in Italy before taking third at the Great Edinburgh Cross Country four days later. In February he returned to his college haunt in Boulder, Colorado to finish a solid third at the USATF Cross Country Championships. Dathan is tuning up for the April 20th Boston Marathon, and with the winter freezing the Great Lakes solid as a tyrant’s heart, Dathan decided to hop a flight south from Michigan on Monday and use Gasparilla as his hard effort. ‘ll have more in depth with Dathan in a subsequent post. Somalia-born and Tucson based Abdi Abdirahman will compete in his first race of 2015, arriving from a six week training stint in Ethiopia with a score of fellow Somali-born ex-pats, including double Olympic champion Mo Farah of England. Mo just broke the world indoor record in the two mile event today in Birmingham, England (8:03.40), a performance that should have Abdi excited about tomorrow’s half marathon. 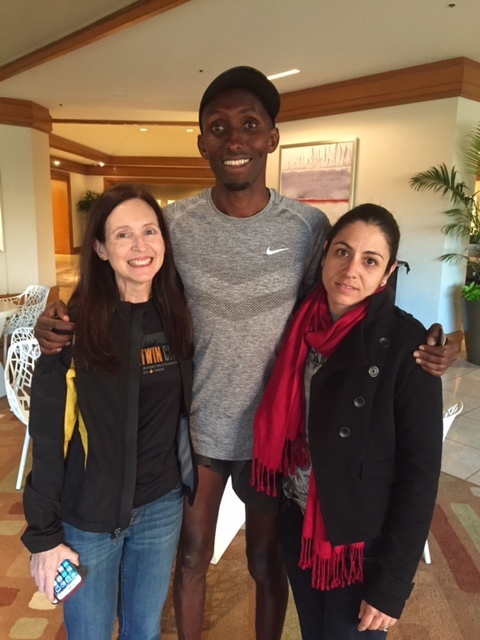 One of the best liked runners there is, Abdi has qualified for four Olympic teams going back to Sydney 2000. In 2012 he returned to form just in time to make the U.S. marathon team for London, holding off a fast-closing Dathan Ritzenhein at the Houston Trials. Both men have their sights set on the L.A. Trials in February 2016. Abdi is still coached by Dave Murray his University of Arizona coach, and says a 62 minute performance in Tampa would suit him just fine tomorrow morning. He has come directly from Addis Ababa, and will suit up again March 15th for the New York City Half Marathon where he will again compete against Ritz and Boston Marathon champion Meb Keflezighi. Last year Ryan Vail broke away from Abdi at mile 9 on his way to a 64:09 victory. Tomorrow’s win may require a slightly better performance as the February 2016 Olympic Marathon Trials are a lot closer in training time than it seems on paper. You could say the countdown has begun. Let’s see who lays down his marker first. Dathan and Abdi will duke it out tomorrow against other Americans Fernando Cabada (5th in Gasparilla 2014), Ian Burrell (7th, 2014 Houston Marathon), Brett Gotcher (8th, 2015 U.S. Half Marathon Champs in Houston), Carlos Trujillo (20th, 2014 Chicago Marathon) and Ben Payne (15th, 2015 U.S. Half Champs in Houston). I will file a report after the race. Wish you had told me y’all were here. Welcome to Tampa Bay! !